This year, Santa can’t wait for Christmas. 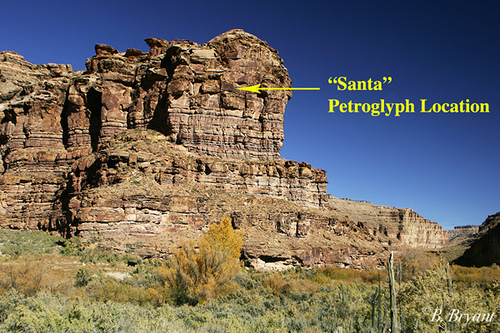 A small, but dedicated group of rock art preservationists in Utah – the Nine Mile Canyon Coalition, and their allies – are fighting to preserve what may be the original Santa Claus. Nine Mile Canyon: Located high on the side of a sheer cliff in a rugged place in central Utah, is an ancient petroglyph that dates back over 1,000 years; it has an uncanny resemblance to the modern day Santa, an elf, and his nine reindeer. A petroglyph is a work of prehistoric Indian rock art that is chiseled or “pecked” into rock, usually into a dark patina surface; the Nine Mile Canyon Coalition and their preservationist friends are seeking to save this ancient petroglyph from destruction. An industrial gas and oil development in the area is slowly destroying this and thousands of other petroglyphs that call this canyon home.